I remember Brussels sprouts. Oh, I remember them very well. They were these tiny little boiled cabbages. They were soggy and flavorless. Forget the smell they left in the apartment, you had to evacuate the building to escape the horrific stench. I remember having to eat them for breakfast if I didn’t finish them at dinner. 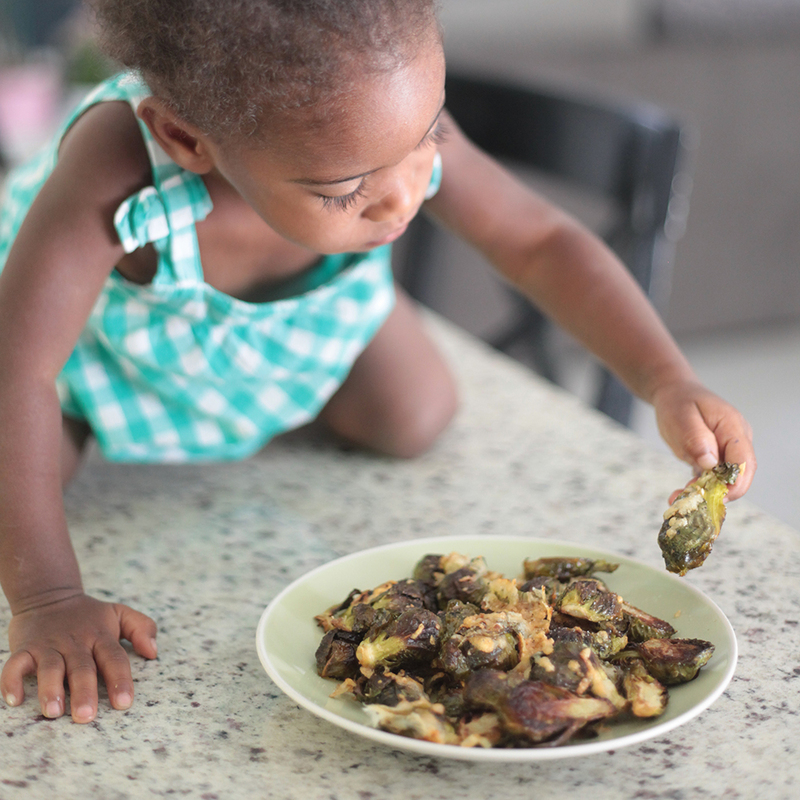 Oh I remember Brussels sprouts. Those are the memories of a 5-year-old girl, forced to eat those soggy little critters. I am now 33 years old, have been eating clean for at least 10 years and have yet to re-try those tiny little cabbage-like green things until today. There are a million ways to make them so I figured I’d just throw stuff I like together and see what happened. I must say, I was pleasantly surprised. A certain little someone climbed onto the counter and snuck in a few as I was taking the pictures. 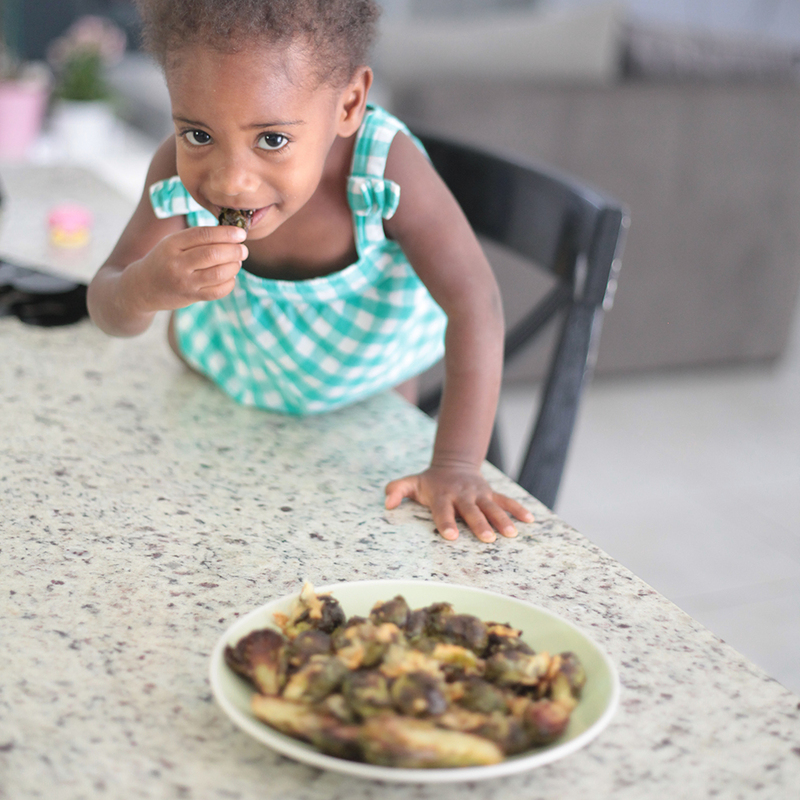 Hopefully her memories of Brussels sprouts will be better than mine. Preheat oven to 400˚. 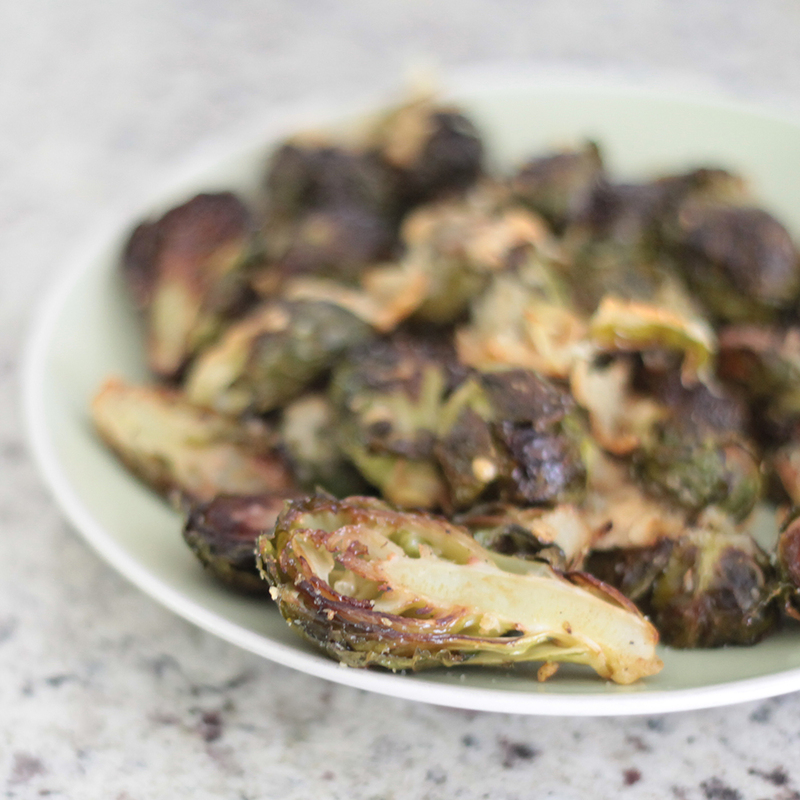 Rinse off the Brussels sprouts and dry them completely. Not drying them fully will result in soggy edges instead of crunchy ones. 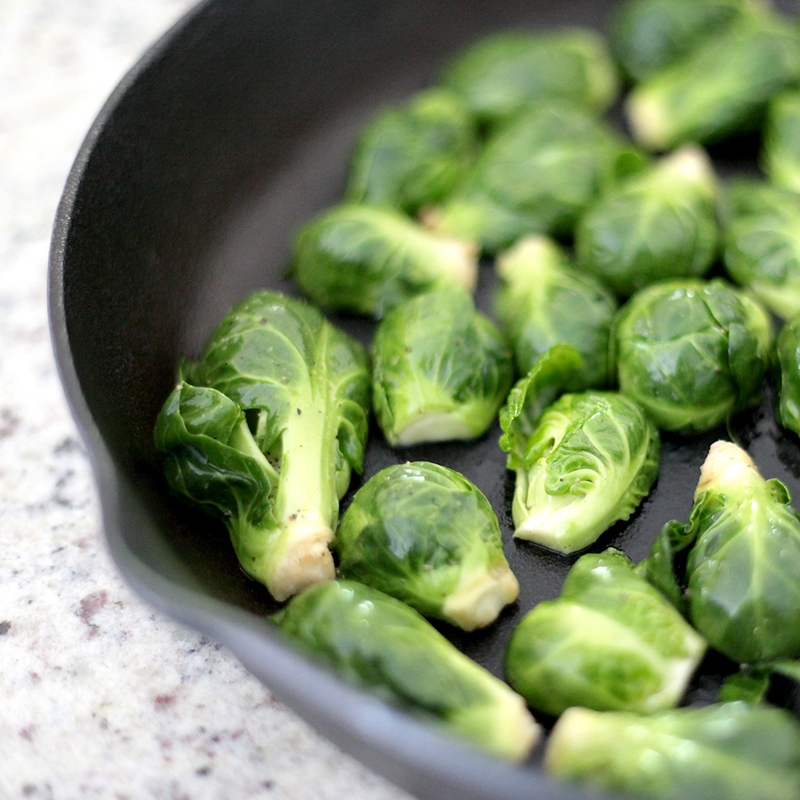 Cut sprouts vertically and toss them in the oil and lime juice. Add salt and pepper. Mix well. Taste it. If it seems salty, it’s probably still not but you can always add more later if needed. Don’t overdo it. 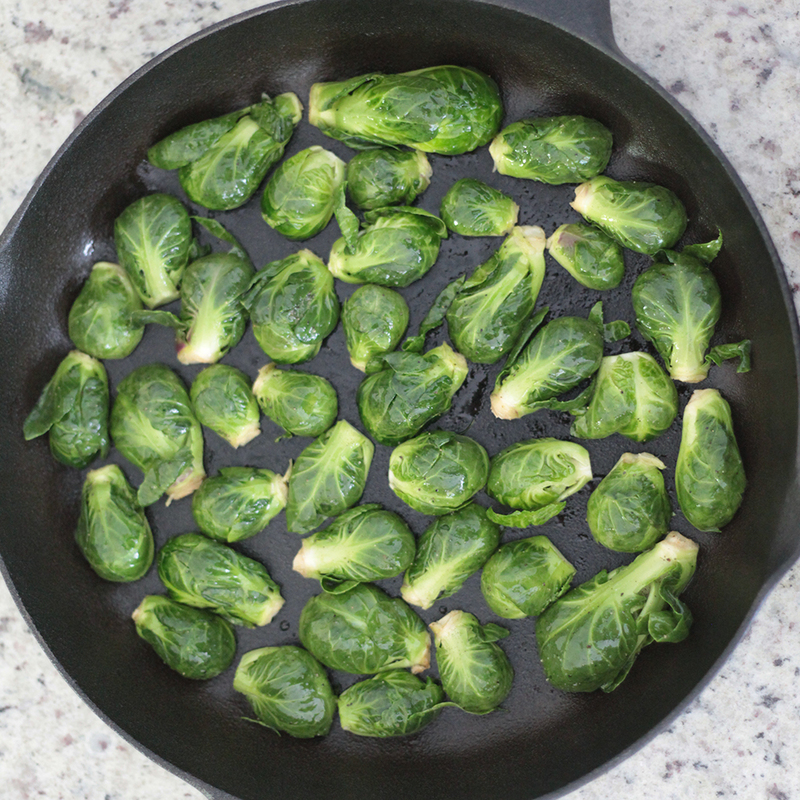 Place cut side down in cast iron skillet or parchment paper-lined cookie sheet. Roast on top rack of oven for 20 minutes, checking occasionally so not to burn them. After 20 minutes, sprinkle Parmesan cheese on top and put back in for 8-10 minutes. When slightly brown, check the texture. If they’re crunchy on the outside, they’re done. If not broil for 1-2 minutes. Careful not to burn them. The outside should be crunchy and the inside should be soft. I like them a little more toasty so I left it in the oven the full 30 minutes. Take it out sooner if you like it softer.